People touched by cancer or a chronic illness are often advised by their doctor to avoid physical activity and rest as much as possible. But for cancer patients and survivors, regular moderate exercise can be a key in improving their quality of life. Recent research shows that exercise can benefit survivors throughout the cancer continuum. 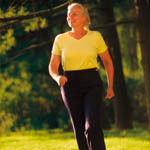 It is important for a person with cancer to remain as physically active as possible. Not enough movement can result in loss of strength, function, and range of motion of the body. Exercise will help keep muscles functioning as well as improving energy levels and quality of life. Exercise can also help during recovery from chemotherapy. While it may not be the first thing you want to do after chemo, research has shown that exercise helps battle cancer related fatigue. The first step is to consult with your health care provider about exercise and whether there are any exercises you should avoid. This is especially true if movement causes severe pain, rapid heart rate, or shortness of breath. If you have physical limitations as a result of your cancer or treatment, it may be helpful to talk to a physical therapist or rehabilitation specialist.